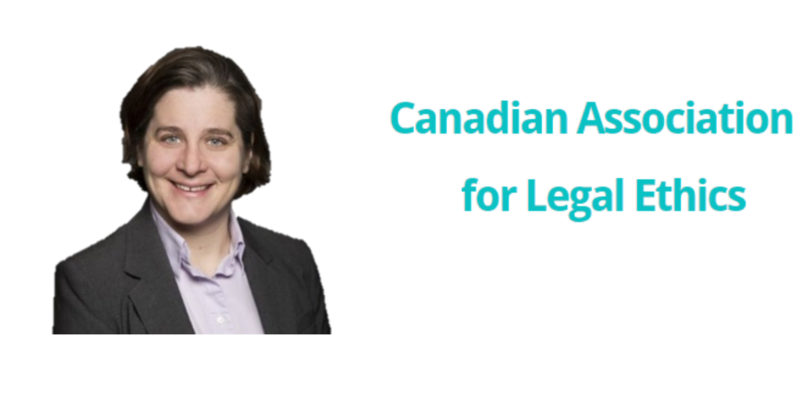 The Canadian Association for Legal Ethics (CALE) is a federal not-for-profit company whose members are academics, lawyers, regulators, and judges interested in topics related to ethics and professionalism in the Canadian Legal Profession. CALE seeks to encourage and facilitate debate on issues of ethics and professionalism in Canada, and to increase awareness about those issues in the public, the profession, and the judiciary. Prior to joining the Faculty of Law at the University of Ottawa as an Assistant Professor, Professor Salyzyn received her LL.M. from Yale Law School and her J.D. from the University of Toronto Law School. She has also served as a judicial law clerk at the Court of Appeal for Ontario and has practiced at a Toronto litigation boutique. Her litigation practice included a wide variety of civil and commercial litigation matters including breach of contract, tort, professional negligence, securities litigation and employment law as well as administrative law matters. In fall 2011, she was a Visiting Researcher at Osgoode Hall Law School. In recent research conducted with two University of Ottawa Faculty of Law colleagues, Professor Suzanne Bouclin and Professor Jena McGill, and with support from a SSHRC Knowledge Synthesis Grant, Professor Salyzyn explored risks and opportunities relating to the use of mobile and web-based apps to enhance access to justice. A report on the research can be found here. This research team, along with Professor Teresa Scassa, has continued its work relating to legal apps with new funding from the Office of the Privacy Commissioner of Canada that will support the development of A Privacy Code of Practice for Legal Apps.